Showing results for tags 'kite making'. 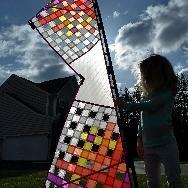 I recently finished my first kite build, and I wanted to throw a public "Thank You!!" out to my kite making mentor: Elliot Shook, who allowed me to follow in his design footsteps, gave me guidance, techniques and encouragement. Without Elliot's generous mentorship this kite would likely still be flying only in my imagination. Holding my kite up to Elliot's work I still have a bit of fine tuning to do, but hey I still need an xtra vent, so I will get better. Elliot's eye for detail and build quality is definitely masterpiece material. I finished it just in time to take it to JB's OBX quad clinic and got to show it off to Elliot and all my best flying buddies. When the wind let up a bit (should have made an xtra vent for that weekend!!) I got to put it up with the sun behind it and it sparkled in the sun beautifully, and seemed to fly just fine. Nothing like seeing your own work flying and keeping up with the others in the sky. it flew just like a Shook should fly: smooth and un-phased by the bumps, in higher winds than I should have put it up in, and pretty as a can be. Also, Thank you to all of the folks who have pulled out kites to let me examine and photograph them, lent me your sails, and answered my questions about sewing and techniques - many of you were generous with your time and knowledge. The generosity of this community never fails to warm my heart and add lift to my efforts. To anyone thinking about taking the sewing plunge....I encourage it. I learned a ton, and kite making materials are not forgiving, so give yourself plenty of practice scraps and time. Oh the joy of flying a kite I built can not be described adequately. Thanks Again Elliot!